Dyson’s cordless vacuums outperform everything else on the market and they pretty much last forever, which makes their high price tags much more tolerable than one might expect. Of course, you’d still have to be crazy not to take advantage of an opportunity to save some cash, and the first ever opportunity just came up for Dyson’s newest model. 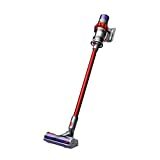 The Dyson Cyclone V10 Motorhead Lightweight Cordless Stick Vacuum Cleaner just went on sale for the first time since its release, with Amazon having shaved $51 off the price of this awesome new model. Definitely grab one while you can. Up to 60 minutes’ run time when using a non-motorized tool. Direct drive cleaner head – our most powerful yet. Up to 20 minutes of fade-free power (in Suction mode II). Drives stiff nylon bristles into carpets to capture deep-down dirt.